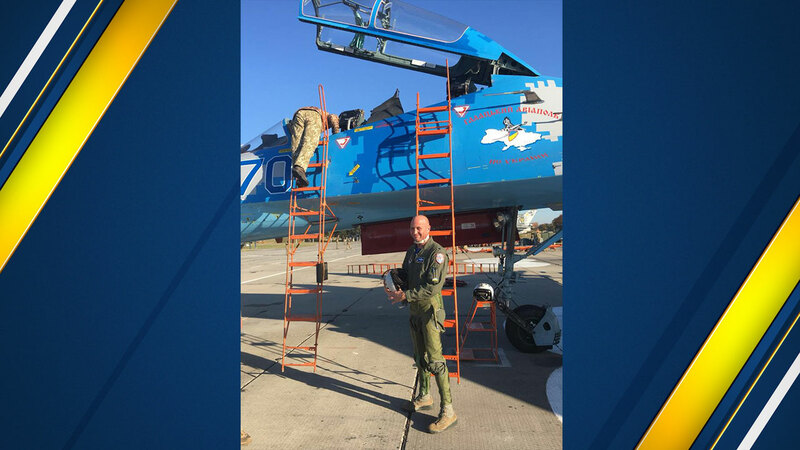 Lt. Col. Seth "Jethro" Nehring, 44, was killed while taking part in a familiarization flight in a Russian-built Su-27UB fighter jet with a Ukrainian counterpart. FRESNO, Calif. (KFSN) -- An airman from Fresno, killed in a crash of a fighter jet in Ukraine, has been identified as Lt. Col. Seth "Jethro" Nehring. Lt. Col. Nehring and a Ukrainian service member were killed when the Ukrainian Su-27UB aircraft they were in crashed during a familiarization flight. Lt. Col. Seth "Jethro" Nehring stands in front of a Ukrainian Su-27UB aircraft parked at the Starokostiantyniv air base in the Khmelnytskyi region of western Ukraine. The two-seat Su-27UB went down on Tuesday in western Ukraine. Nehring was a fighter pilot with the California Air National Guard's 194th Fighter Squadron, part of the 144th Fighter Wing based at the Fresno Air National Guard Base, located on the southeast corner of Fresno-Yosemite International Airport. The Air Force says that Nehring has been a member of the 144th for more than 20 years. Nehring began his career as an enlisted crew chief before being selected as a pilot. He flew the F-16 Viper for more than 15 years, before converting to the F-15 Eagle. The familiarization flight was part of a joint military training exercise called Clear Sky 2018, which kicked off last week. Clear Sky brings together more than 950 personnel from Ukraine and eight NATO nations. The familiarization flights give NATO service members an opportunity to ride in Soviet or Russian-built aircraft, like the Su-27UB fighter jet. The Air Force says that Nehring was handpicked to take part in Clear Sky due to his more than 20-year career as a pilot flying the F-16 Fighting Falcon and F-15 Eagle aircraft. In a statement, U.S. Air Force Col. Daniel Kelly, commander of the 144th Fighter Wing said, "We are a close-knit family and when a tragedy like this occurs, every member of the 144th Fighter Wing feels it. We share in the sorrow felt by Jethro's loved ones and our thoughts and prayers go out to his family and friends as well as those of the Ukrainian aviator." California Governor Jerry Brown and the First Lady also extended their deepest condolences to Nehring's family and friends. The U.S. and Ukrainian governments are investigating to determine the cause of the accident.